Fly Fishing? Exercise from an unlikely source! The ways we can get exercise without even trying is amazing. Sometimes a fun hobby can lead to a great form of exercise. 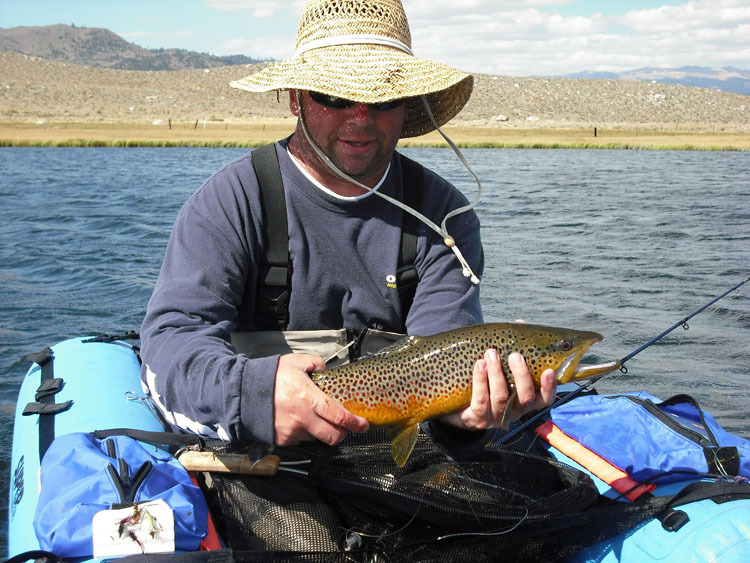 I started fly fishing several years ago and I fly fish out of a float tube. Not only am I having a blast doing it, but it is a fun and exciting way to get some exercise. A float tube, also known as a belly boat or kick boat, is an inflatable boat that is human powered. You sit above the water, with your feet hanging into the water, and use a set of fins attached to your feet to propel yourself around the lake, similar to what a scuba diver uses. You also wear waders and stay completely dry. The boats are so quiet and smooth that you create a stealthy approach to the fish. I always knew that float tubes were a great way to catch fish, but I never considered the exercise benefit until I introduced it to a few of my older friends. These gentlemen had given up on fly fishing completely. The local streams and rivers had become too tough for them to hike. They had been fly fishing their whole lives and the fact that the fishing years were over was depressing to them. One morning in the shop, one of the older gents overheard me discussing how much fun float tubing could be and asked if someone his age could do it. I said, “It doesn’t matter how old you are, and for that matter, you might get some exercise.” I agreed to take him out the next week. From the start of the float tube trip, I could tell he was going to enjoy this new way of fishing. All day I heard screams of joy as he caught fish after fish. It had never been so easy for him. We were able to sneak up on the fish, and we even saw them swimming under the float tube. When the day came to an end, my friend gave me a big hug and said that he felt great and that I had added years to his fishing. At the same time, the exercise from paddling around the lake made him feel great. My friend is now float tubing two to three days a week and his family says he hasn’t looked this good in years. We have added several more older people to our group of float tubers and I know for a fact it has helped them stay healthy. One gentleman is approaching 90 years of age. If you enjoy fishing (or want to learn) and could use a little extra exercise, I would give float tubing a try. You’ll be happy you did. Frank Seifert owns Off the Hook Fly Shop (offthehookflyshop.com) and is one of two people (Frank and his cousin) to complete the California Department of Fish and Game’s California Heritage Trout Challenge completely out of a float tube (http://www.dfg.ca.gov/fish/Fishing/Recognition/HTC/).